In America's construction industry, the increase in productivity has coincided with an increase in standards for safely working at height. Implemented and enforced by the United States Department of Labor and the Occupational Safety & Health Administration (OSHA), regulations related to helping to prevent injury from falls applies to all industries, including construction. In order to comply with these regulations, and to gain better worksite efficiency, you need to partner with a supplier who understands your industry and provides equipment that is an asset to your business, and not just an everyday obligation. In construction, that supplier is SafeSmart Access. SafeSmart have been servicing the construction industry with construction scaffolding, portable height access platforms and more for over twenty years, in the United States, Europe, the UK, Canada, New Zealand and Australia. 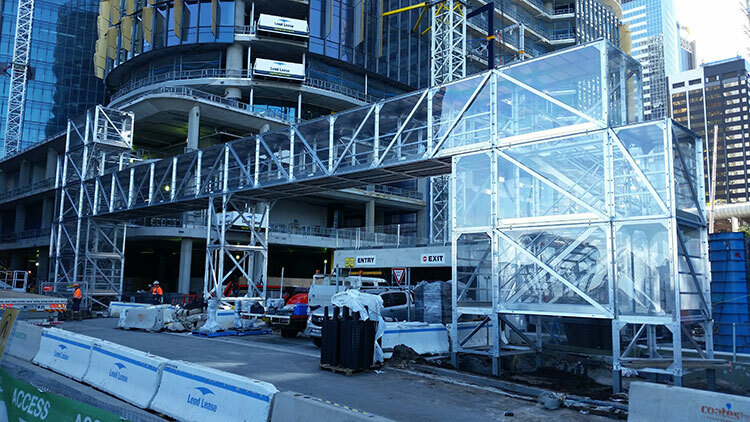 Mobile Scaffolding – from steel (Proscaf) to aluminum, we have easily transportable and easy to install systems suitable for all levels of access and durability. Ladders – from step ladders to extension ladders to more specialized options like fiberglass ladders for electricians. Platforms – everything from truck access platforms to customized platforms for accessing harder to get to work spaces. Edge protection systems – compatible with all of our steel and aluminum scaffolding range, OSHA-compliant and effective. Of course, our construction scaffolding solutions will be the best choice for most situations, but for better access around more irregular structures or architecture, a more customized height access solution in needed. For all American contractors, we offer this service. From an onsite inspection, to a drafted solution, to manufacture and delivery, SafeSmart can help you with any access requirement, that is OSHA-compliant and effective. If you are in the construction industry, and you have any questions about our products, call America's premier place for portable height access products: SafeSmart Access.